Maxime Pierre Dethomas (October 13, 1867 - January 21, 1929) was a painter, draughtsman, pastellist, lithographer, illustrator, and was “among the best known metteurs en scene and decorators” of theatres (Huddleston, 126). As an artist, Dethomas was highly regarded by his contemporaries and exhibited widely, both within France and abroad. During the later part of his career, he is best remembered for his work overseeing set and costume design for the Theatre National de l’Opera and the Théâtre des Arts, Comédie-Française. The Musée d'Orsay (Paris), the Pushkin Museum (Moscow) and the Hermitage Museum (St. Petersburg)hold works by Dethomas, but the majority of his best work remain in the private collections of his descendants. A large collection of Dethomas's theatrically related work is held at the Bibliothèque-Musée de l'Opéra National de Paris. 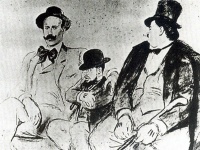 Dethomas is also remembered for his close friendship with the artists Henri Toulouse-Lautrec, his brother in-law Ignacio Zuloaga and his contribution to Les Nabis. Dethomas died in 1929 and was buried at the Passy Cemetery in Paris (Prade, 131). Born in the Paris suburb of Garges-les-Gonesse, Maxime Dethomas came from a long line of painter-printers on one side of his family and of lawyers on the other. His Father, Jean-Albert Dethomas (1842 -1891), was an important Parisian politician. His Step Mother Louise Thierree (Jean-Albert married twice – Maxime was of the first marriage) belonged to the affluent middle-class of Bordeaux (Milhou, 1979). Dethomas enrolled at the Ecole des Arts Decoratifs in 1887 at which he studied for a brief time, followed by a more varied course, from 1891 onwards, at the Societe de la Palette (boulevard de Clichy) directed by Henri Gervex, Puvis de Chavannes and Eugene Carriere (Taylor, 78). Carriere’s influence played a significant part in the early development of Dethomas’s art, and he would go on to be a close friend of both the artist and his family. Dethomas passed much his time at the bookshop of the Revue Indépendante (Independent Review) run by Edouard Dujardin, and it was here that Dethomas first met Louis Anquetin and Henri Toulouse-Lautrec. Dethomas worked primarily as an artist from the early 1890s until his appointment in 1910 as the director of design at the Theatre de Arts. Dethomas’s style owes most to Degas, Toulouse-Lautrec, Legrand and Forain (Wright, 221). Dethomas himself claimed that his inspiration was guided by artists of earlier generations, particularly Goya, Delacroix and Manet, but his individuality of style ensured he would “not be influenced in his work by any methods or thoughts other than his own” (Taylor, 78). He realised vigorous charcoal drawings showing views of Paris and Italy, as well as portraits of his friends Edmond Rostand, Catulle Mendès, Toulouse-Lautrec, Henri de Régnier whose Esquisse Vénitiennes he illustrated, Forain, etc. Dethomas was a prolific lithographer, and through his close connections in literary circles, many of his lithographs were published in print. 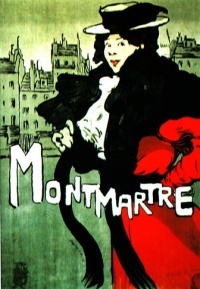 He illustrated works by Maurice Donnay, Octave Mirbeau and, in 1922, Molière's theatre. In a letter of introduction for Dethomas, written by Lautrec in the summer of 1895 to Joseph Ricci, Lautrec refers to Dethomas as his dear friend and compliments him as a painter “who doesn’t talk about his paintings, something that is be admired”. Dethomas produced advertising posters as early as 1897, which, as with his contemporaries, contributed to his fame (see: "Montmartre" advertising the 1897 book of the same name. Jane Vorhees Zimmerli Art Museum, New Jersey). Dethomas marketed his art via the Durand-Ruel Galleries and Galerie Druet and is known to have had his works framed by the frame-maker and art dealer Pierre Cluzel (1850–1894) and his successor L. Vivien at Cluzel’s workshop at 33 Rue Fontaine, Montparnese. Dethomas worked under Jacques Rouché at the short lived Theatre de Arts (1910-1913). Upon his appointment as director, Rouche enlisted the talents of several artists of Les Nabis group who had contributed to the Grande Revue , including Jacques Dresa, Rene Piot and Maxime Dethomas , none of which had previously worked for the stage (Garafola, 86). As chief set designer or director of the Services Plastiques, Dethomas embarked on a career that would last for the remainder of his life. The Theatre des Arts represented a major shift away from facile acting, shallow content and the painted-canvas drawing rooms of commercial theatre, that were the norm in early 20th century European theatre. The inaugural production, Carnaval des Enfents (1910), marked a major theatrical revolution by which Dethomas’s settings accentuated line and colour, rather than painted detail and endless props. Against blue, ochre, grey and steel, black costumed characters created striking pictorial compositions in lighting effects that “varied like inflections in a conversation.” The Theatre de Arts went on to present nearly twenty plays, including Jacques Copeau’s adaptation of Brothers Karamazov (1911), and the production of La Tragedie de Salome (1912), both a popular and critical success (Garafola. 154). Due to the small size of the theatre, it eventually ran into financial trouble and closed. Hired to direct and design at the Paris Opera (1914-1936), Rouche and Dethomas went on to offer fresh interpretation of old material and to make inroads into stale scenic convention (Londre 498). By 1917 Dethomas was also designing sets for the Comédie Française (Carson, 79). Dethomas’s reputation was such, that in early 1912, he was commissioned by the British Aristocracy to design a set for a London masked ball with some 2000 guests (Howard, 92). Guillaume Apollinaire felt that Dethomas’s influence on French Theatre had “transformed the art of scenery, costume design and staging (Bruenig, 221). In 1926 the Opéra Comique in Paris celebrated Manuel de Falla's 50th birthday with a program consisting of La Vida Breve, El Amor Brujo, and Master Peter's Puppet Show, with new designs by Falla's close friend Ignacio Zuloaga, and new marionettes carved by Dethomas (Agen, 150,180). Dethomas once wrote that above all else decor should be a good servant of the play and that a designer must get beyond a painterly “feel” to something more solid (Cheney, 5, 92). Lautrec nicknamed him “Grosnabre” for his dead-pan face; Thadee Natanson described him as a gentle giant , polished and discreet – “He was so frightened of wearing anything that might draw attention to himself that even the black of his clothes seemded duller than that worn by others.” Paul Leclercq states that what fascinated Lautrec about Dethomas was “his ability to preserve an impassive appearance even in a place of amusement (Cooper, 130).” Lautrec and Dethomas formed a close friendship during the early 1890’s – so much so that Dethomas became Lautrec’s “closest friend” (Craven, 280). Dethomas' placidity, corpulence and extreme shyness (he always blushed when he had to raise his voice) endeared him to Lautrec (Lassaigne, 119). Two know portraits of Dethomas (by Lautrec 1896 and Opissio) show Dethomas with his face averted, which says much of his shy manner. They often visited brothels and cafes in the Montparnese together (Neret, 133); these visits played an intrinsic role in the development of Lautrec’s Art. During the summer of 1895 Dethomas travelled to Normandy coast with Lautrec (Cooper, 130). Lautrec moved to 30 Rue Fontaine from June 1895 onwards, near Dethomas, and stays there until 1898. 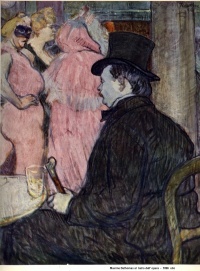 In 1896 Lautrec paints the famous portrait of Maxime Dethomas at the Bal de l’Opera (N.G. A., Washington ) and Debauche Avec Dethomas, a lithograph later used on the cover of an exhibition catalogue (Dortu, 263). In 1897 (20 June-5 July) Dethomas sailed Holland's canals on a barge with Lautrec and visited Utrecht and the Frans Hals Museum at Haarlem (Cooper, 130; Gauzi, 27; Southbank, 538). Their friendship lasted until the end of Lautrec’s life (Cooper, 152). During the 1890s, Dethomas formed a close friendship with the artist Ignacio Zuloaga, who lived in Paris at this time (Boone, 179). Zuloaga studied under Eugene Carriere with Dethomas, and by 1892 they were close friends - Dethomas invited Zuloaga to stay with his family for some period – during which Zuloaga formed a bond with Maxime’s Half-Sister Marie-Valentine. Zuloaga went on to marry Marie-Valentine on May 18, 1899, with Eugene Carriere and Isaac Albaneiz as witnesses (Milhou, 1979). The author Pierre Louys was also a close companion of Dethomas and had collaborated with him on the first edition of Le Centaure in 1896. During August and September 1898, Dethomas acted as a marriage broker of sorts, attempting to bring together his sister Germaine and Pierre Louys, a plot that was thwarted by Dethomas’s Step Mother (Neideraruer, 71-73). 1896 - Exhibited at the thirteenth Impressiontistes et Symbolistes exhibition. 1900 - An important exhibition of Maxime Dethomas's art took place in Paris. 1903 - Exhibited at Durand-Ruel Gallery (Bucknall, 178). 1905 - Exhibited at the 3rd Salon d'Automne at the Grand Palais, Paris (Ref: Exhibition catalogue). 1907 - Exhibited at the Fifth International Exposition of Barcelona, with Zualoga and Rodin. 1908 - Exhibited at the Exposition de la Toison d’or, Moscow (Ref: Exhibition Catalogue). 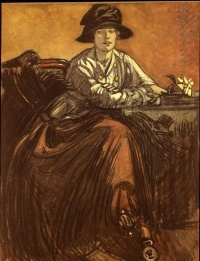 1908 - Exhibited with Rodin and Zuloaga at the Kunstverein, Frankfurt, Germany. 1911 - Exhibited at the 10th Autumn Salon (Salon d’Automne) in the Grand Palais des Champs-Élysées (J.Huncker, N.Y. Times, Sept. 1911). 1911 - Exhibited at the International Exhibition of Turin (Apr. – Nov.). 1912 - Exhibited at the Artz and De Bois in The Hague, Netherlands (Mar. - Apr.) with Bussy and Huszar (Blotkamp, 81). 1913 - Exhibited with the Exposition annuelle 2eme groupe at Galerie Druet (Feb.17 - Mar.1) with Baignères, Desvallières, Dufrénoy, Fleming, Guerin, Marque, Marval, Rouault and Mare. 1913 - Exhibited at the Societa Leonardo da Vinci (May 11-31), in Florence, Italy. 1914 - Exhibited with the Exposition annuelle 2eme groupe at Galerie Druet (Feb.9 - 21) with Baignères, Desvallières, Dufrénoy, Fleming, Guerin, Marque, Mrs Marval, Rouault, Bernouard and Moreau. 1915 - Exhibited two framed drawings in the French Pavilion of the Panama-Pacific International Exposition (PPIE) Worlds Fair, San Francisco, U.S.A..
1916 - Exhibited at the Detroit Museum of Art, U.S.A.. The exhibition of PPIE works. (October Exhibition Catalogue) Lot. 80 - "Yvonne", Lot. 81 - "Jeanne"
1922 - Exhibited (solo) at the Musée des Arts Décoratifs, Paris (Apr.12 - May 7). 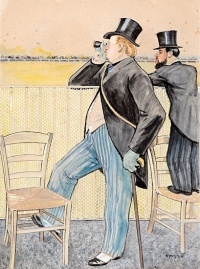 1928 - Exhibited (solo) drawings and watercolours at the Galerie Simonson, Paris (Mar.20-Apr.5). 1992 - Exhibited (solo) at the Musee d'Orsay, Paris (Feb.25 - May 24). Agen, Manzani Diaz. Manuel de Falla: His Life and Works. Omnibus Press, 1999. Blotkamp, Carel. De Stijl: The Formative Years, 1917-1922. MIT Press, 1986. Bucknall, Barabara. Critical Essays on Marcel Proust. G.K. Hall, 1987. Carson, Lionel. The Stage Year Book. Carson & Commerford, 1917. Carter, William. Marcel Proust: A Life. Yale University Press, 2002. Cheney, Sheldon. Stage Decoration. Blom, 1966. Garner, Philippe. Encyclopedia of Decorative Arts. Galahad Books, 1982. Gauzi, Francois. My Friend Toulouse-Lautrec. Spearmen, London, 1957. Hecht, Anne. Toulouse-Lautrec: Paintings, Drawings, Posters, and Lithographs. Museum of Modern Art, N.Y. 1956. Howard, Jean. Shakespeare Reproduced: The Text in History and Ideology. Routledge, 2005. Huddleston, Sisley. France and the French. Cape, 1928. Huntington Wright, Willard. Modern Painting - Its Tendency and Meaning. Lassaigne, Jacques. Lautrec: Biographical and Critical Studies. 1972. Londre, Felicia. The History of World Theatre. Continuum, 1999. Milhou, Mayi. Ignacio Zuloaga et la France, These d’Histoire de l’Art, October 1979, Bordeaux III. Neiderauer, David. Pierre Louÿs, His Life and Art. Canadian Federation for the Humanities, 1981. Prade, Guy de la. Le Cimetière de Passy et ses Sépultures Celebres. Editions des Ecrivains, 1998. Taylor, E.A. The Studio - Vol 84, No 353, August 1922, London. Unless indicated otherwise, the text in this article is either based on Wikipedia article "Maxime Dethomas" or another language Wikipedia page thereof used under the terms of the GNU Free Documentation License; or on original research by Jahsonic and friends. See Art and Popular Culture's copyright notice. This page was last modified 11:51, 31 December 2013.